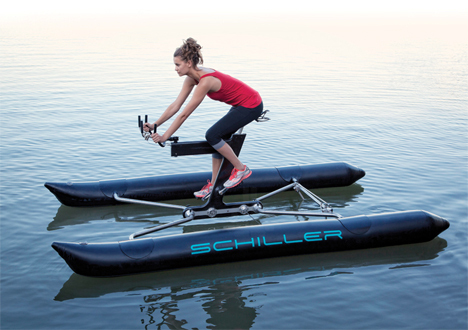 The Schiller X1 is one of the most exciting advancements we’ve seen in biking in quite some time. 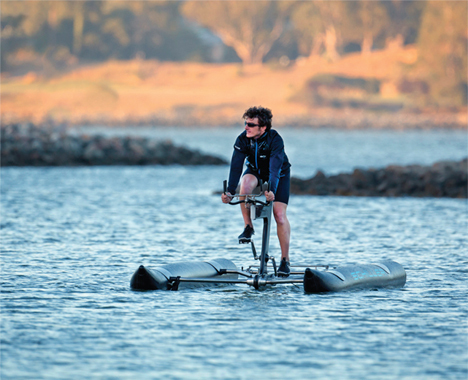 The X1 gives cyclists the exhilarating experience of biking across water. Equipped with two dual-chamber inflatable pontoons, the aqua bike weighs a trim 45 pounds thanks to its lightweight anodized aluminum and stainless steel frame. 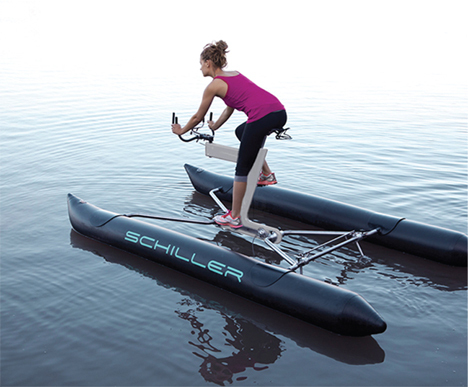 The bike drives like most others, with two pedals and handlebars, but instead of wheels it features two oscillating propellers that move it across the water. It can support up to 300 pounds and comes equipped with high-intensity LEDs so you’ll easily see and be seen. Unlike some of the other floating bikes (and there have been a few, both commercial and homemade) the X1 can reach speeds of up to 8 knots (10 miles) per hour. The handlebars provide simple and accurate steering, and the X1 can even go in reverse. Safety was a huge concern for the company as they designed the amphibious bike. 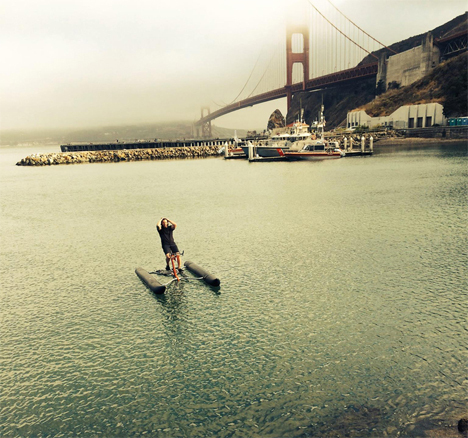 They assembled a team of top-notch designers, engineers, craftspeople, and sports experts to perfect the water biking experience. When you’re ready to pack it in and head home, the X1 disassembles in under 10 minutes and is compact enough to be transported on most bike racks and in car trunks. Its zero-emission, silent, human-powered styling makes it a seriously eco-friendly way to travel without the traffic, car exhaust, and rude drivers you’d encounter biking on the street.